A High Court order has been passed for the arrest of those who remain, but they intend to appeal. THE REMAINING SQUATTERS at the Grangegorman community project on Dublin’s northside are planning to appeal a High Court order calling for their arrest. The group had initially been directed to leave the premises by midnight on 4 May, but at least 20 people remain in residence on the site. Those who remain plan to appeal the latest High Court order, issued on Tuesday, to the Supreme Court. “We’re exhausting all legal avenues, and we do intend to take an appeal to the Supreme Court,” spokesman for the group Gréum Ná hEaradh told TheJournal.ie. We have no intention of going anywhere. We also have no interest in violent resistance, particularly not with the gardaí, whom we have a good rapport with. We are under no illusions that we need them, and our resistance will be as peaceful as possible. The squatters have turned the buildings and vacant space on the site into a home and community space with a vegetable and herb garden and entertainment venues. They are refusing to leave until an alternative venue is offered to replace what they say has become a vital service in the community. TheJournal.ie paid a visit to the complex last weekend, and found all present in very relaxed mood, while a full soundcheck took place on stage inside one of the three large warehouse buildings. 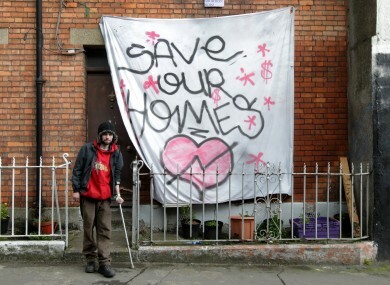 Following a protracted all-night eviction process by receivers in March (involving the Garda helicopter), the High Court ordered those occupying the buildings to leave the site by 4 May. The residents had since come to a loose agreement with the receivers in order to remain at the complex while discussions were ongoing. Email “The Grangegorman squatters have no intention of moving...”. Feedback on “The Grangegorman squatters have no intention of moving...”.